ATTENTION: CEO's Blog has Moved! : Still Waiting for the Stimulus? February 13, 2009- A firm believer that breakfast is the most important meal of the day, the other day when it finally passed 50 degrees in Boston, I was meeting a friend at our neighborhood eatery. Unfortunately, I never got my eggs due to the new “Recession Hours”. They cut breakfast. Later that week, I decided to head out to the local electronics store in search of a new GPS device, only to be met with a colossal STORE CLOSING sign. I even missed the big closeout sale. Unfortunately, hospitality and retail aren’t the only industries suffering while the government grapples over a stimulus package. As we approach the April budget season, our schools are telling us the cuts are running deep. Twenty staff members at this school. Eighty-five staff members in that district. Class sizes over 30 again. Junior varsity sports eliminated. No more music program. Of our 2,000 high schools, these are not isolated reports. Education leaders all across the country are looking for ways to trim the fat and save money where it hurts the least. For schools in our network, saving money in the counseling office is now a proven reality that superintendents are celebrating. We recently asked counselors to cost out how much it actually costs them to deliver transcripts to a college as part of a college application. We found that some schools bundle the costs because applications, recommendation letters, school profiles, transcripts and any other supporting materials fall upon the counseling office. But regardless of how the school operates, we also found that the processing of an official transcript is the most time-consuming and costly piece of the puzzle. On top of that, in many instances records need to be sent with the initial application, then the 7th semester report, then the final transcript. More compounding costs that often get taken for granted, even with data that says application numbers are on the rise. Once a school determines that it can save anywhere from $3K to $20K by delivering transcripts electronically, changing “business as usual” becomes more appealing. In Michigan, where schools are already sending over half their transcripts electronically, the word is spreading. H.H. Dow High School broke down their costs. The official transcript paper, the school envelope, the stamp and the salary cost per minute of pulling a student record from the data system, then printing, stuffing and sealing. It costs them on average $6.71 to process one transcript one time. Do the math based on the number of college-bound students and the average number of colleges on each college list and the cost approaches $10,000. Now take the education budget in the state of Michigan, for example, where Dow is one of 215 high schools already positioned to connect electronically with 15 colleges in a rapidly expanding network. 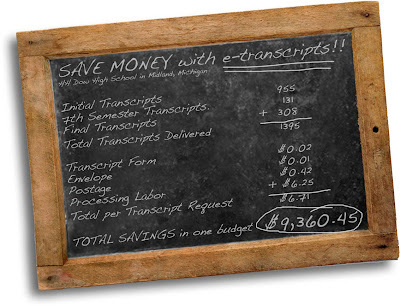 Simple math demonstrates a savings potential of over $2 million– just by sending transcripts electronically. Implement the initiative in all 1,127 high schools and Michigan could stand to trim its budget by over $11 million. There’s a reason why education technology is a key ingredient highlighted in the stimulus package and just think, this e-transcript technology does not cost a high school a cent. So while the dwindling aid to education outlined in the stimulus package continues to be reconciled, schools can wait to see what piece of the pie makes it to their plate. Or schools can take control and re-think how they operate to save money before the cuts reach them. Now that’s stimulating news. Agreed -- schools really could use the stimulus money, but there are still strategies districts can adopt to save a little more and even to bring money dollars to their schools. Check out Online Fundraising Tips for Your School. Most schools at least have Internet access -- if used properly, this resource can be a gateway to more school funding.